Last week we posted about Project Planning For Seasonal Hiring. One thing to consider if you are getting ready for seasonal hiring is the Work Opportunity Tax Credit. Whether you are hiring 10 employees or 100 employees (or more) your company may be eligible for employment tax credits via the Work Opportunity Tax Credit (WOTC). The Work Opportunity Tax Credit (WOTC) is a Federal tax credit incentive available to employers for hiring individuals from certain target groups such as Veterans, individuals on SNAP (food stamps) or long-term unemployed individuals who have consistently faced significant barriers to employment. Based on our 20+ years of experience on between 10-15% of new hires may qualify. Whether full-time or part-time, the WOTC certified employee must work a minimum of 120 hours in order for the employer to receive a 25% tax credit on the first $6,000 of their wages. If the individual ends up working 400 hours, you could be eligible for a 40% tax credit of the first $6,000 of their wages or $2,400. 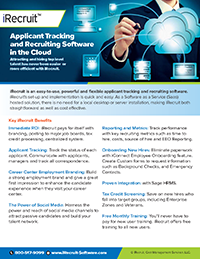 iRecruit can provide WOTC screening and administration as part of your service, included with iRecruit, and/or iConnect Electronic Onboarding. Or you can do it separately without iRecruit. We offer three easy-to-use screening options including a secure web-form, a 24/7 call center and paper based. To learn more about iRecruit’s Work Opportunity Tax Credit (WOTC) services, please contact us below or call 800-517-9099 to ask about WOTC. This entry was posted in Blog, iRecruit Blog and tagged hiring, onboading, seasonal hiring, work opportunity tax credit, wotc. Bookmark the permalink.